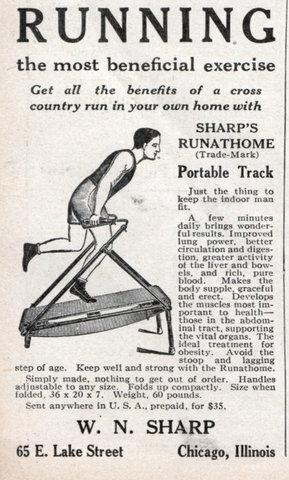 Just the thing to keep the indoor man fit. A few minutes daily brings wonderful results. Improved lung power, better circulation and digestion, greater activity of the liver and bowels, and rich, pure blood. Makes the body supple, graceful and erect. Develops the muscles most important to healthâ€” those in the abdominal tract, supporting the vital organs. The ideal treatment for obesity. Avoid the stoop and lagging step of age. Keep well and strong with the Runathome. Simply made, nothing to get out of order. Handles adjustable to any size. Folds up compactly. Size when folded. 36 x 20 x 7. Weight. 60 pounds. Sent anywhere in U. S. A., prepaid, for $35. Shouldn’t this also be in the ‘Origins’ category as the first unintentional dirty clothes rack?